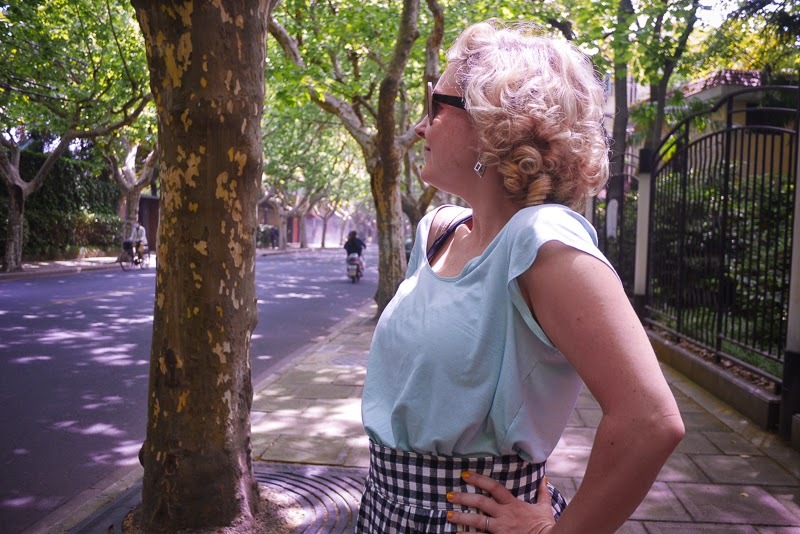 Hello from Fuxing Xi Lu! 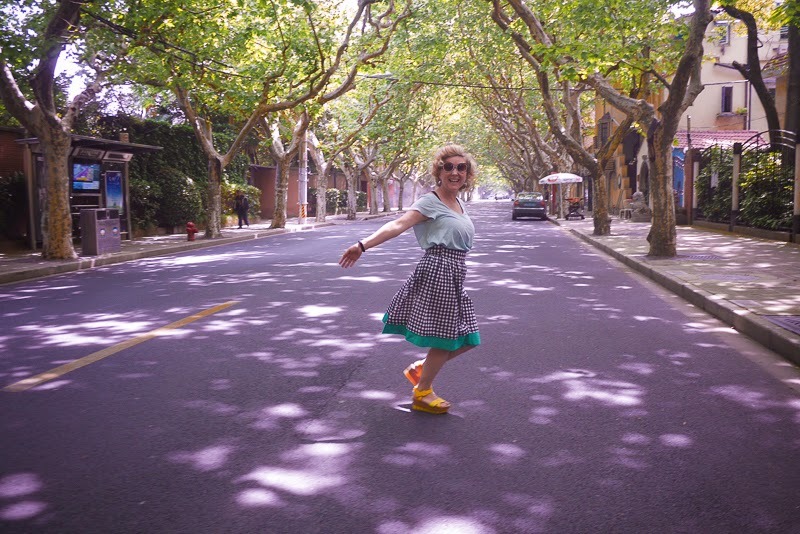 It's springtime in Shanghai! 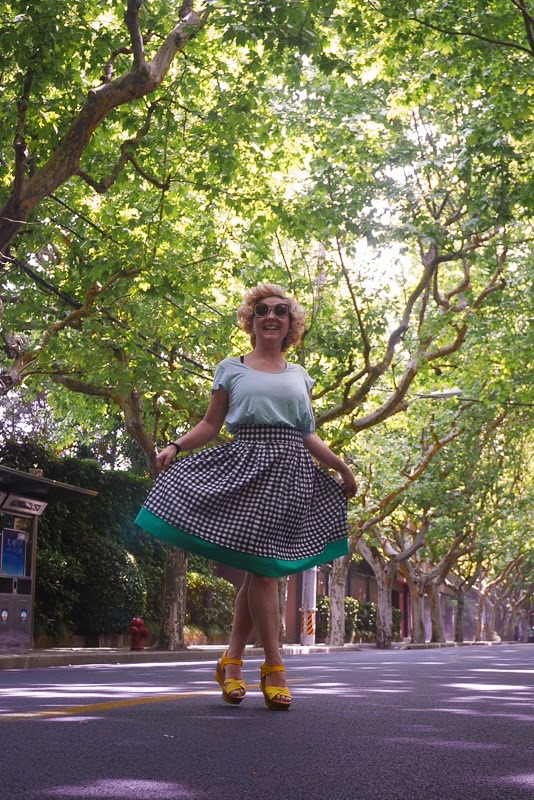 And today here's a 'no pattern' outfit... a gathered gingham skirt with a linen hem... with a floppy blousie thing. A knit tshirt tucked in... sounds more posh as a blouse. 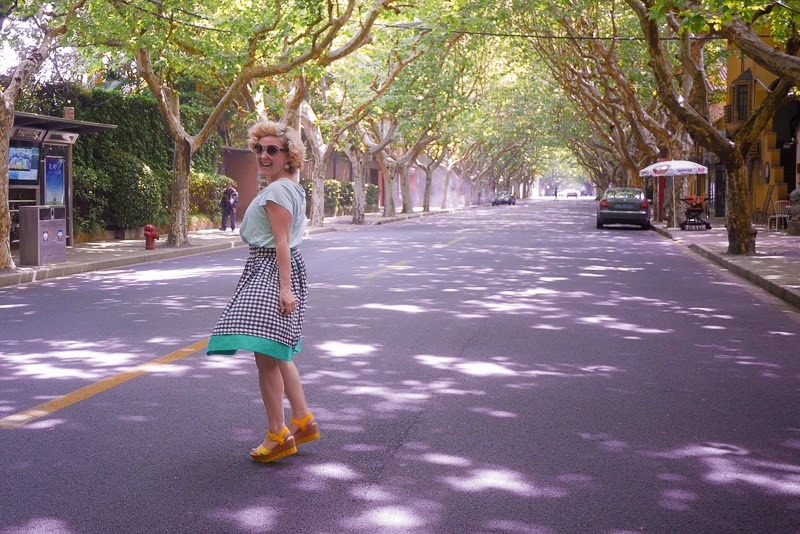 I'm in the Former French Concession in these photographs, so it's totally a blouse. 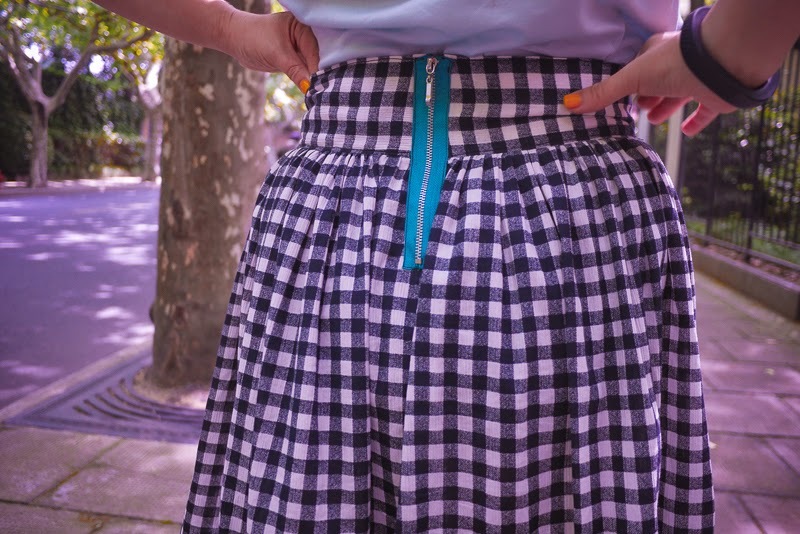 A few weeks ago, I made some gingham trousers for my little boy, as part of my Sewing School... and since I'm buying 2 metres (liang mi in Chinese) of fabric these days (is that how much you buy? 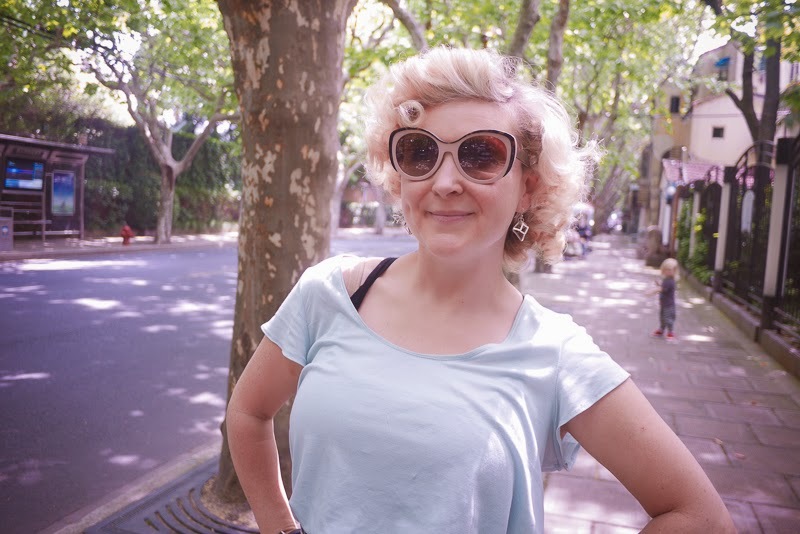 A bit different from op shopping - I would usually just buy everything at the op shop/thrift store)... I had some left over. Childrenswear doesn't take up much fabric, of course, so there was enough for a gathered skirt of some kind, so I fiddled around for a while finding the right kind of shaped rectangle (the skirt) and making sure I had a waistband as well... and then during all my fiddling and folding and checking I found the green linen remnant! This year, with a small stash, and an even smaller scrap box I'm trying to use it all up... mostly it's easy to make kids clothes from decent scraps, but I'd also like to push myself to make different clothes to what I'd usually make. 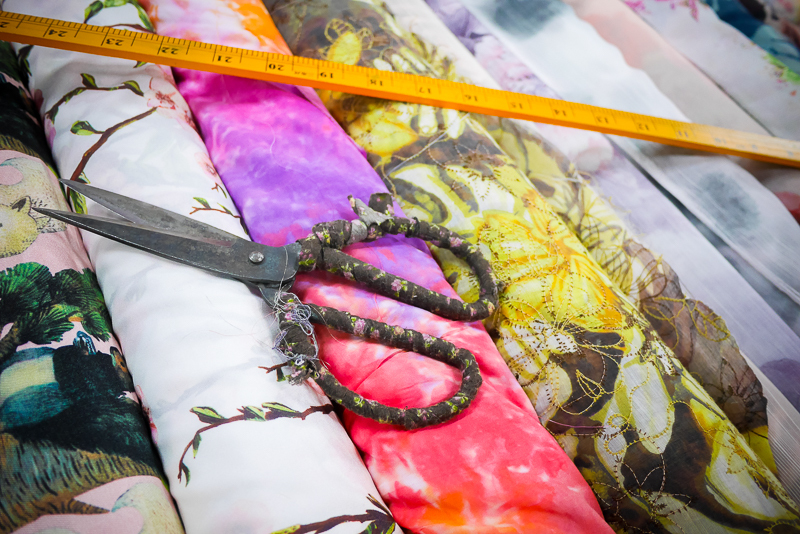 Because usually, I take short cuts and choose easy patterns with sewing, and it's time to change! So my spare green linen has become a hem, and added length and weight for the skirt to be perfect for bike riding. 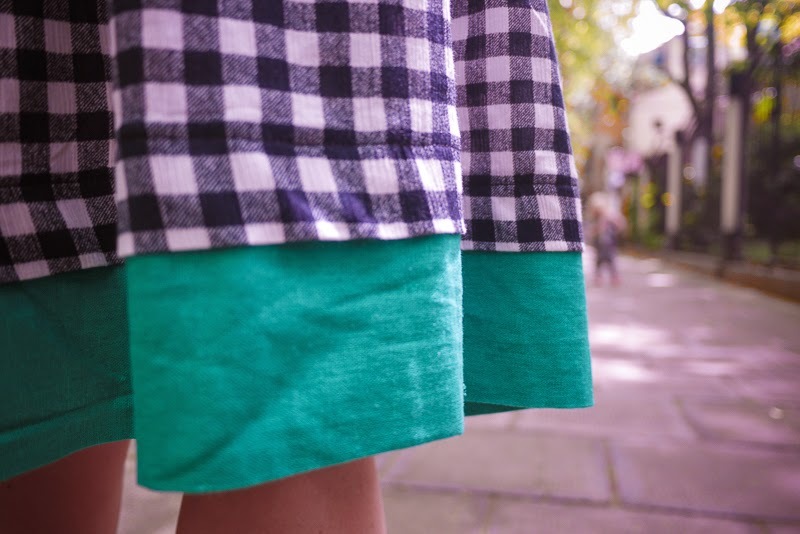 The hem became my main focus for a while, and it turned out how I'd hoped, with this little flap of the gingham over it, as you can see above. I cut two long pieces of the green linen to match the skirt pieces, overlocked them together... then stitched them together vertically. A bit more faffing around, pinning and ironing (linen is just so perfect to iron, but creases so terribly) I then topstitched the green bit underneath to create the flap in the gingham fabric. That's me sewing without pattern & directions, I guess! A FAFFER. My blouse is kinda the same... I did use a bodice piece from a McCalls pattern I've brought with me (it's for a woven pattern though) but traced it to have more of a swing from the bust and then I winged the sleeve tracing around an old RTW tshirt... but ended up cutting it into a cap-style. While it's a totally wearable floppy t-shirt, it's not really the best fit or shape... again, no pattern makes it all a bit weird for me. (I have been pinning a few actual t-shirt patterns since trying this one) The fabric was from my local fabric store, which is tiny and they had about 10 knits to choose from (with different weights) ... and this feels like it will pill eventually. :( BUT it's nice enough to wear when it's warm and really, I'm trying out some different shapes on my bod! 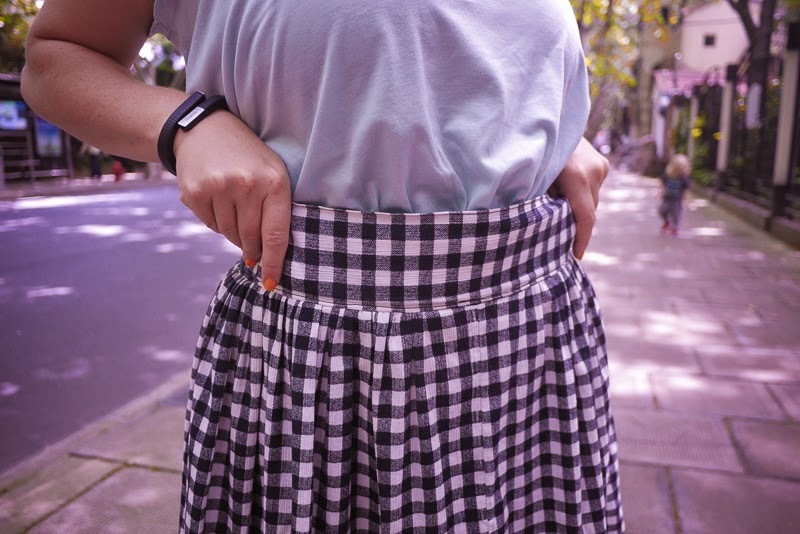 I have worn this skirt at least 3 times for Me-Made-May already... so that's a good sign! I love the heavy hem on the bike so it stays over my knees ok. But because I kinda went a bit fast with putting it together after I got the hem so lovely, it does annoy me a bit that the gingham isn't matched well. OH WELL! 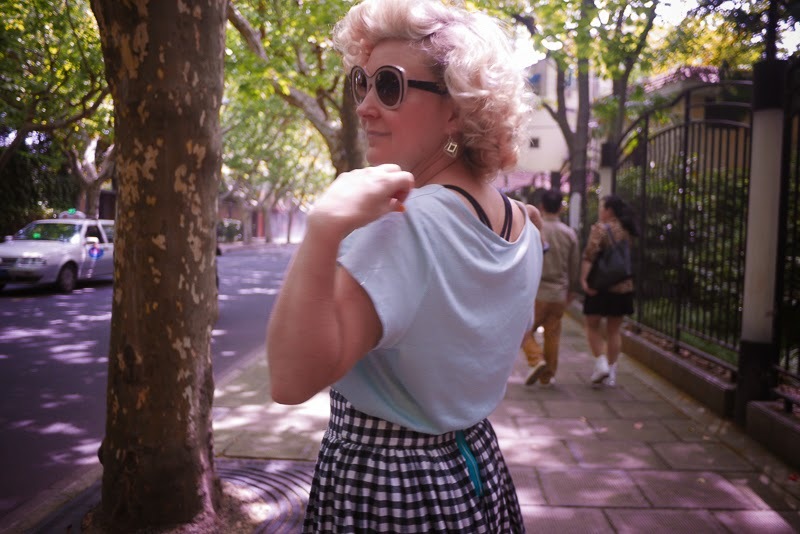 Looking at the photos I have such full on pin curl hair! This fringe is totally bouffant! And lastly, I have completely LOST the blouse! We have a housekeeper who does our clothes washing (everyone has a Ayi in China) and I can't find where she's put it! So I need to make more now... and get a bit better at sewing them as well. Have a great week, talk soon!